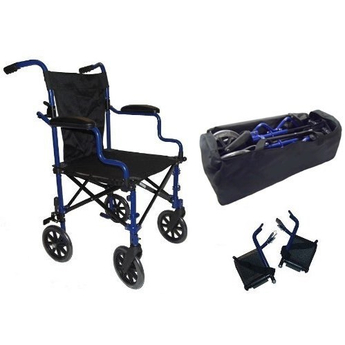 This Heavy Duty Travel Wheelchair comes with a Travel Bag. 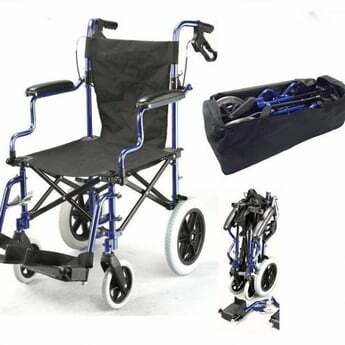 This wheelchair folds to approx 1/3 of the size of a typical folded wheelchair, making it ideal for holidays, days out and shopping trips. 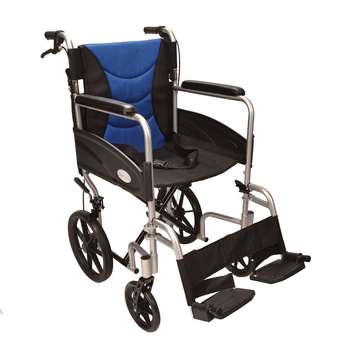 Compared to similar wheelchairs in its class this chair has some additional features which make a big difference. The arm rests are shaped "desk arms" designed so that the user can be positioned closer to a table, without this feature the user would find it hard to pull up to a table and enjoy a cup of tea or meal. Flip up padded desk arms. Dual action brakes so the attendant can slow the wheelchair down and lock the brakes on from the brakes on the push handles. 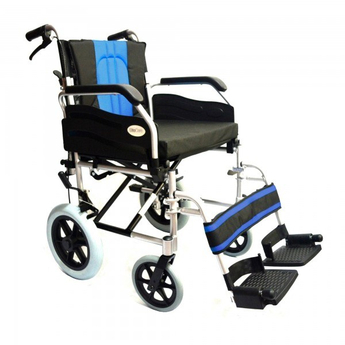 Aluminium frame in metallic blue. 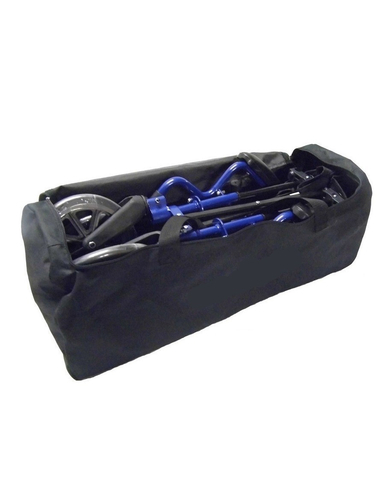 12″ Solid puncture proof rear tyres, 8″ solid front tyres. 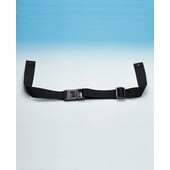 Quick release height adjustable footrests. The deluxe Wheelchair in a bag has attendant handbrakes not found on the standard wheelchair in a bag. 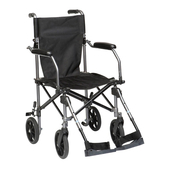 It also has 12″ puncture proof rear tyres whereas most similar models only have 8″ castors. 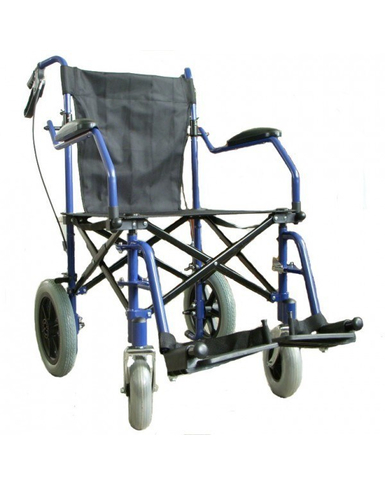 Width - 56cm / 23"
Folded Width - 28cm / 13"
Seat Width - 46cm / 19"
Seat Depth - 41cm / 17.5"
This product is excellent. Its easy to fold and fit into the bag. My wife doesn't always need a wheelchair but we keep this in the boot of the car and its a great piece of mind to know its always there. She finds it comfortable and I find it easy to push and steer. Yesterday we went to the the supermarket and when we got there she decided she was not feeling capable of coming in, so rather than leave her in the car I opened the chair and wheeled her along. Sometimes its the small things.